These thick, pre-moistened wipes kill 99.9% of viruses and bacteria on hard nonporous surfaces when used as directed. Ideal for quick cleaning, Lysol wet wipes disinfect and deodorize your household surfaces and are strong enough for the toughest messes. Use on kitchen counters, appliances, stove tops, cabinets, floors, garbage cans, toilet exteriors, bathtubs and sinks. Lysol wet wipes can also be used safely on electronics including Smartphones, remote controls and tablets. These powerful wipes almost effectively remove 95% of allergens, including pollen, dust mites and pet dander. Lemon and lime blossom scent. Includes 3 canisters of 80 wipes each. 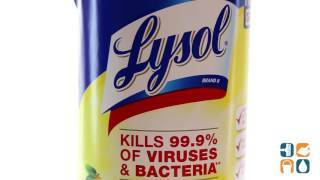 Order this 3-Pack of Lysol Disinfectant Wipes today and save!